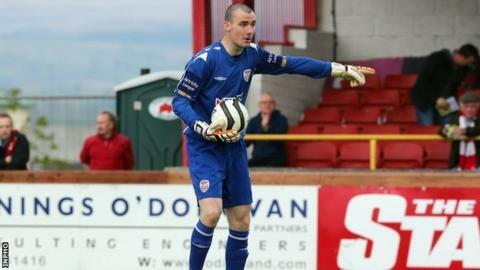 Derry City came away with a point they scarcely deserved from this Premier Division game at the Carlisle Grounds. Bray created the better chances, with Ger Doherty saving from Graham Kelly and Ismahil Akinade before the break. Kelly also missed a penalty in the 40th minute when his powerfully hit effort came off the underside of the bar. Enda Curran, Rory Patterson and Michael Duffy had scoring opportunities for Derry in the second half while Kelly twice went close again for the hosts. Wanderers dominated the first period as Derry's indifferent early season form continued. Kelly's deflected free-kick was saved superbly by Doherty and Akinade then forced an outstanding low stop from the Candystripes goalkeeper. Visiting boss Roddy Collins made an early tactical substitution when he replaced Patrick McEleney with his brother Shane on 33 minutes, then two minutes later Aaron Barry met the ball at the back post but his attempt flew over the bar. Danny Ventre handled inside the area but Kelly's spot-kick was adjudged not to have crossed the line after cannoning off the woodwork. Derry came into the match more in the second half and Curran curled a free kick round the wall, but Stephen McGuinness did well to save. At the other end, Kelly raced onto a through ball from David Scully but his drive across the face of goal flew just wide. Another Kelly piledriver was tipped over by Doherty, before Patterson turned and shot, but McGuinness saved low to his right. Derry will hope for a better performance when they play Limerick at the Brandywell on Easter Monday (15:00 BST kick-off).